The Busanga Plains is in the north-western part of Kafue National Park . The Lufupa River feeds the floodplains. Many times the river bursts its banks and then recedes creating rich grasslands. These grasslands attract large concentrations of antelopes. 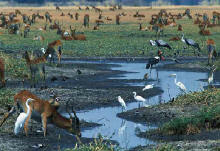 This northern sector of the Kafue National Park is well known for its sitatunga, red lechwe and puku. Predators such as lion and leopard are frequently seen. The spectacular Busanga Plains is a vast flat expanse that stretches in all directions as far as the eye can see. It is one of Zambia’s most significant wetland resources. Here human development or activity has not taken root. This vast wetland wilderness gets flooded in the wet season by several rivers and streams. It covers a huge 750 square kilometres that drains into the Lufupa River which in turn discharge into the Kafue River. The floods reach their height between March and May. As the water recedes on the onset of the dry season large herds of hippo get stranded in the shallow pools. Fifty years ago, lechwe were almost extinct in this area. But their numbers have greatly increased since the establishment of the national park. The lechwe presents a sight of great beauty as they wander in vast herds across the golden plains. During the wet season they splash about in the shallow waters. And behold the lion who usually dislike water take to chasing them through water even where the water is at least a half a metre deep. It’s not uncommon to see prides of lions up to twenty. Other antelope found here are blue wildebeest, Lichtenstein's hartebeest, buffalo, zebra, reedbuck, oribi, puku and impala (frequently seen) . Bushpig and warthog are also inhabitants of the plains. The shy swamp-dwelling sitatunga is found here, its widespread hooves enabling it to walk on the floating reedmats. Roan antelope are seen regularly in the northern sector as well as big herds of sable of up to 40 strong. Cheetah and Leopard also roam the plains. Being in the plain the cheetah is able to exercise their famous speed of up to 125 kilometres an hour. At Kafwala the Kafue River splits into channels creating foaming rapids. It rejoins and continues south to Itezhi-Tezhi, where it is dammed into a massive lake. Itezhi Tezhi Dam covers an area of 370 square kilometres. Elephant, buffalo, zebra, hartebeest and wildebeest frequent the dam. In many parts grassy plains surround this vast inland sea where hippos often graze. Rocky bays and stretches of submerged trees provide perfect perches for the many waterbirds. Common birds that inhabit the area are fish eagles, cormorants, spoonbills and the stately goliath heron. The southern sector is well known for its roan, sable, oribi, eland, Lichtenstein's hartebeest. Cheetah is often seen in the Nanzhila Plains. Elephants are most likely to be found around Ngoma and Chunga.